The design of the ancient Cho’jac net bag of the Mexican Mayan people is reinterpreted in this project, in order to create a collection of sophisticated, sustainable bags and accessories, which honour their humble origins. Although one may find the Cho’jac amongst artefacts in an ethnological museum, they are nevertheless still used in certain areas of Maya-Tzotzil culture. There is evidence that these net bags have been rooted in Mesoamerican culture for thousands of years – a true relic. What to Westerners appears to be an unusual form for a bag is due to the combination of the actual net with a leather strap worn across the forehead to aid the carrying of heavy loads. 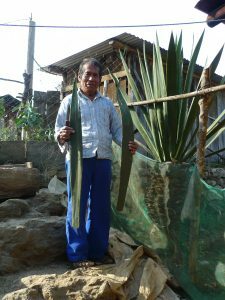 Thanks to the Agave plant fibers used in the net, which are turned into a delicate yet surprisingly stretchy mesh over the course of several weeks of work, the net is highly resilient. 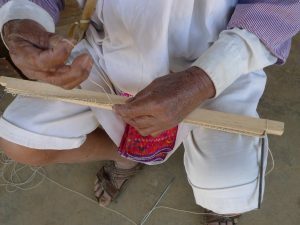 The knowledge and technique needed to produce the Cho’jac is passed on to future generations by word of mouth, but the import of cheaper replacement bags and the resulting declining demand for the Cho’jac present a serious threat to the continuation of this artisanal craft. The sociocultural background formed the main basis and motivation for the Cho’jac project. Therefore the design is not solely the focus, but its integration in a larger context. Currently the development is concentrated on a reinvention of the Cho’jac design, and combining it with additional, sustainably sourced material components produced in Germany, in order to adapt the bag design for a wider audience. Aside from the transformation of the traditional net bag, the cooperation with indigenous families carrying on this craft, and the development of a marketing concept were central parts of the project, aiming to secure the conservation of this tradition long-term by acquiring new revenue streams. 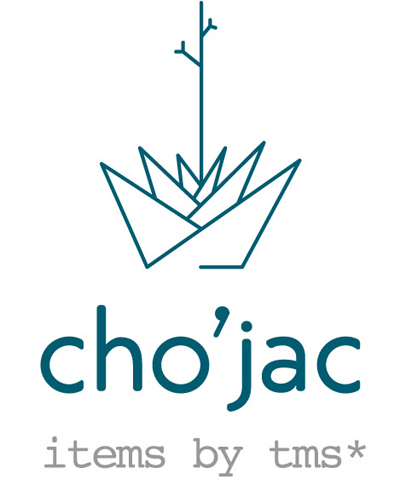 The sustainable approach of the Cho’jac project does not just apply to the original craftsperson, but in fact takes the entire production chain into account. And so as the final touches are applied to the bag in a workshop for disabled people, a lining made of linen woven in Germany, and straps from locally-produced, naturally-tanned leather are added. The concept also looks beyond the production aspects and aims to create an intercultural, global dialogue. Yes, indeed a “luxury item” is created in the form of a designer bag, but its aesthetic is based on a kind of social bricolage. Its value does not lie in an expensive, rare material or in social prestige, but in the sustainable process it embodies, which combines craftsmanship with social and aesthetic aspects anew. The whole concept – nominated for several important design prizes – was meanwhile extended and implements free and easy accessible courses in the region of Chiapas, in order to propagate this traditional cultural handicraft amongst the native population, and involve the local artisans in the development of new design variants.